FARMINGTON HILLS, Michigan, July 11, 2017 /PRNewswire/ — Leaders of the Gulf Cooperation Council Standardization Organization recently entered into an agreement with the American Concrete Institute to cooperate towards a better understanding and use of concrete and cementitious materials in civil infrastructure. 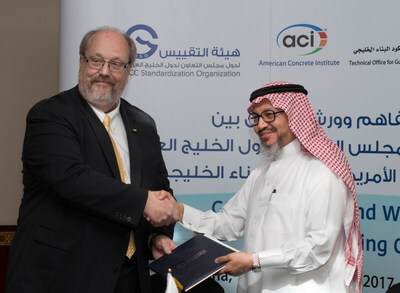 The agreement – signed in Doha, Qatar, by Ronald G. Burg, Executive Vice President of the American Concrete Institute, and Dr. Nabil bin Ameen Molla, Secretary General of the GCC Standardization Organization – provides a framework for cooperation. Specifically, the agreement provides permission to utilize ACI’s Building Code Requirements for Structural Concrete (ACI 318), Specifications for Structural Concrete (ACI 301), and Building Code Requirements for Masonry Structures (ACI 530), to develop a Gulf Building Code. Once the Gulf Building Code is published in late 2019, ACI content modified to accommodate local conditions will be readily available to engineers, professors, students, and the governments of Bahrain, Kuwait, Oman, Qatar, Saudi Arabia, United Arab Emirates, and Yemen.